"Ivor’s life is turned upside down after a falling plant pot sparks a series of paranoid reactions." This is the graduation project of Joseph Wallace and Emma-Rose Dade. The film tells the story of Ivor, an old retired man who lives on the top floor of an apartment block. When a plant pot falls from his window he asks the question ‘what if I fell?’ and so begins a series of escapades driven by his paranoia of falling. The film was made at Newport Film School over a period of around eight months and the project was developed on Animation Sans Frontieres, animation production workshop. The animation draws upon a combination of stop-motion puppet animation and paint-on-glass 2d animation to tell the story. 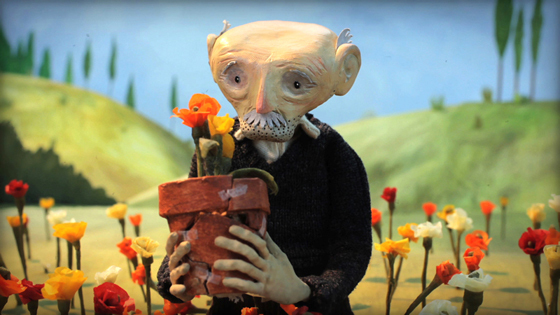 Everything in the film has been made by hand, from the tiny flowers to Ivor's little laced shoes. Every time something moves on screen it has been manipulated by hand, 24 frames per second. The sets are made from recycled cardboard and everything is painted with acrylic paint. This is a film about fragility, life and hope.